Product prices and availability are accurate as of 2019-04-08 14:54:42 EDT and are subject to change. Any price and availability information displayed on http://www.amazon.com/ at the time of purchase will apply to the purchase of this product. Save time while maintaining a high level of quality and dependability with this Canon Color imageCLASS MF8580Cdw wireless laser all-in-one printer. There's no need to rush between office machines, so you have more time for creativity. Wireless networking for greater flexibility. Makes it easy to set up your printer where you want - no need to run long cables. A wired network connection is provided, too. 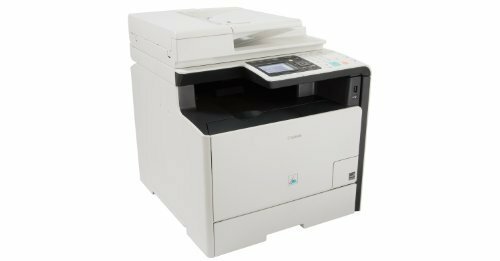 Canon Color imageCLASS MF8580Cdw printer has impressively speedy printing and copying - up to 21 pages per minute in color or black-and-white. Mobile print support lets you print on the go. Supports Canon Mobile Printing, Apple® AirPrintTM and Google Cloud PrintTM. 50-sheet auto document feeder makes copying, scanning and faxing multiple pages a snap. The feeder also supports 2-sided documents. Canon Color imageCLASS MF8580Cdw wireless laser all-in-one printer features automatic 2-sided support that saves on paper. Allows 2-sided printing, copying, scanning and PC faxing.